I’ve been thinking of both those killed at the Boston Marathon as well as those maimed in the bombing. To be an amputee is heartbreaking, especially given that people were injured at an event which extols physical achievement. In 1941, Joan encounters a young man who is an amputee.
. . . Went to Billings Hospital this morning [to volunteer] and, as they had measles, they sent me downstairs to read Captain Horatio Hornblower to a boy. Turned out to be Joe Harmon whom Emily was telling me about Wednesday, . . . 19-year-old freshman from Purdue University. Leg amputated just last week. Hurt it playing basketball. Nice-looking boy with good lean features, bright blue eyes and dark hair. I didn’t read at all, we just talked—about college and everything. . . . Somehow then the scene from All Quiet on the Western Front came back to my mind—where the two soldiers visit their friend whose legs have just been cut off and they realize how helpless they are—and I had that same feeling. 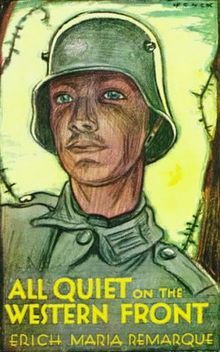 The cover of first English language edition; design is based upon a German war bonds poster by Fritz Erler. So I smiled foolishly and we went on talking about college and baseball. . . . And I think perhaps he was fooling me, too, talking about such trivial things—when there was a consciousness of something else there . . . A nice-looking boy I might play bridge with in the Coffee Shop or meet on a double date. People, all round the world. But he said, “I’m not going to let this thing get me down.” I felt so moved in front of so much reality. After a while Emily came for me and we laughed that we hadn’t been reading at all. Well, Joe Harmon, good luck to you. . . .
starring Lew Ayres where the friends visit Franz whose just had his leg cut off. If you would like to contribute to The One Fund for the Boston Marathon victims, please look at this page. 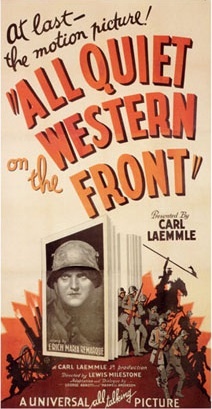 Posted in Susie's Blog and tagged all quite on the western front film and novel, Billings Hospital, Boston marathon and bombing, Captain Horatio Hornblower, Francis Bacon, Fritz Erler, lew Ayres, New Atlantis, Purdue University, The one Fund boston. Bookmark the permalink. This is a great site, Susan, and a wonderful project. I can relate to some of what you are doing, having published one small book and begun working on a larger one about my father’s experiences during WWII — based on his memories and his myriads of stories. People today really do need to know what life was like then, and there’s no better, purer way to explain it that through the personal words of that generation. I wish you great success with the book and with your blog site as well. Dear Sandra, Thanks so much for your kind comment. What is your book? And that’s great to be working on one about your dad’s experiences in WWII. I agree that we have to hear the words of that generation FROM them rather than just ABOUT them.